Inspired by the open-air fresh market grills of Asia, Flat Top Grill opened its first location on the north side of Chicago in September 1995 (yes, we are that old; but we prefer "seasoned"). We still look good—almost as good as our carefully chosen ingredients, which are grown by gifted farmers. Custom-selected by a discerning foodie who knows your preferences better than anyone (that would be YOU). Cooked with care, by us. Life should be lived with flavor. After all, food is not just fuel. When done right, even casual street fare can stimulate your senses. Ears lock on the sssssssound of the sssssssizzle. Pupils dilate. Nostrils twitch. Taste buds stir. Breakfast. Lunch. Dinner. Here, you can have a YOU-nique, interactive experience some people call mealtime. In a place where you can kick back, be yourself and unwind in the company of friends old and new. At Flat Top Grill, we believe each meal should be memorable. Feisty flavors. Stand-up-and-shout textures with ingredients so fresh, your momma will smack them. You're our guest. You decide. Shouldn't your meal be prepared precisely to your tastes and preferences, whether you are paleo, vegan, nut-allergic, gluten-free or just plain hungry? We think so. Our enthusiastic cast of characters will make sure you've got what you need, just how you like it—from our homemade sauces to our signature Roti bread. 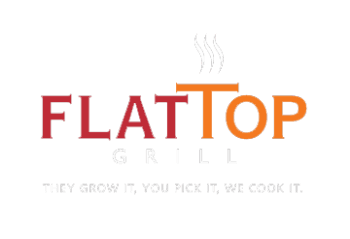 At Flat Top Grill, they grow it, you choose it, we cook it. C'mon in. Grill's on! Sign up and join our eClub to get exclusive offers like a gift on your birthday. PLUS a free treat just for joining!